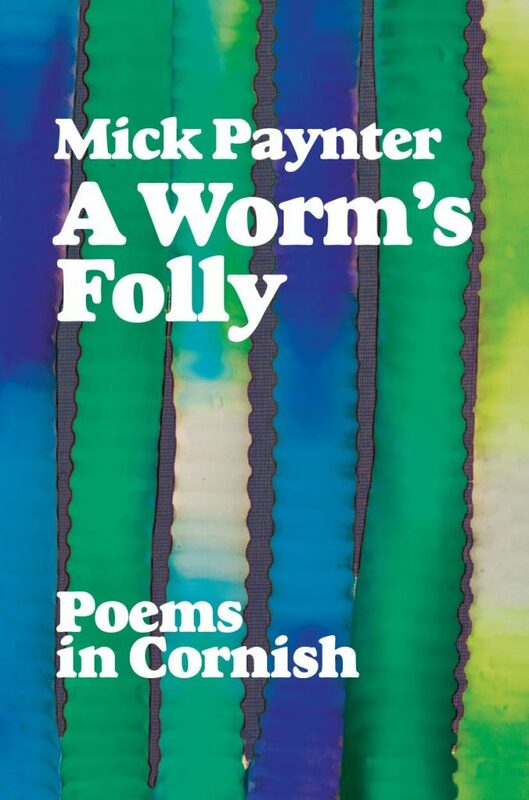 A Worm’s Folly is the fullest collection of poetry in the Cornish language to date by Mick Paynter, whose Bardic name, Skogynn Pryv – Worm’s Fool – gives the book its title. Paynter writes in a variety of forms – touching and humorous, polemical and angry – and with a deep affection for Cornwall and the Cornish language. The poems are accompanied by parallel translations into English. Also included in the collection are a number of translations into Cornish from other sources – English, Yiddish and Breton poems, Blues songs – showing the versatility of the language. Mick Paynter was born in 1948 in St Ives and has lived there most of his life. He worked in several jobs before settling down as a Revenue Officer in Cornwall and has been an active trade unionist all his working life. He has always had an interest in language and began a serious study of Kernewek in 1999, productively filling many long train journeys as a union rep. He became a bard of Gorsedh Kernow in 2003. His Bardic name is Skogynn Pryv/Worm’s Fool. He is currently Grand Bard of Gorsedh Kernow. Mererid Hopwood is a respected Welsh language poet and the first woman to win the bardic Chair, and the first to have been awarded the Crown and the Prose Medal at the National Eisteddfod of Wales. Mick Paynter is left-handed, has always had “a Cornish orientation,” used to be a bolshie trade unionist, doesn’t drive a car and still hitch-hikes occasionally. These facts illuminate and inform a great deal of the content of this bilingual collection by a rebel poet of many causes. His introduction displays the zealousness characteristic of many learners of lesser-used languages: “I love it… it carries in it the soul of Cornwall,” he writes. For Welsh speakers, as Mererid Hopwood notes in her preface, it is possible to imagine the “sounds of the sister language” when reading the Cornish version. She’s surely right to hope that the collection will inspire other writers to express their life experiences through the medium of their grandmother’s – or ancestors’ – tongue. Second or third language speakers find it easier to express their innermost feelings through the medium of their newly-acquired language because their mother tongue has ingrained in them a more school-orientated, formal outlet for their experiences. Many of these poems have the characteristics of the single-stanza englynion – a kind of haiku – of the Brythonic branch of the Celtic tree. The pithinnes and the strong consonant-based element that characterise these short poems in Cornish present a challenge to any translator. These poems certainly deserve a wide readership, not least because of the apparent ease with which Paynter combines age-long and contemporary themes. His “warm feeling” whenever he crosses the Tamar into Cornwall could become the experience of all readers who are willing to read and embark on these poems’ westward journey. Alfred Wallis and the artistic community of St Ives, the iconic events of the 1497 Cornish Rebellion; ‘cow tipping’ in Cornwall during the First World War; and D. M. Thomas’s life of the Cornish rugby legend, Bert Solomon – this new anthology, varying in style and subject matter, offers professional and amateur performers and directors, as well as the general reader, an exciting range of plays with a distinctive Cornish flavour. A history of dance in Cornwall, from the earliest references in Cornish literature to the dances of the folk revival today, accompanied by tunes traditional and modern, for use in schools, festivals, workshops and country dances. The product of twenty years’ work, this volume draws together poems from collections published between 1990 and 2010. Alan M. Kent has written a new Nativity play with all the flavour of the medieval Celtic masterpiece but with a distinctive contemporary Cornish voice. In this book we find the characters of the familiar Nativity story, along side Cornish sailors and tinners and Joseph of Arimathea and his legendary journey with Christ to Cornwall.